The System x3650 M4 server provides outstanding performance for your mission-critical applications. Its energy-efficient design supports more cores, memory, and data capacity in a scalable 2U package that is easy to service and manage. With more computing power per watt and the latest Intel Xeon processors, you can reduce costs while maintaining speed and availability. This product guide provides essential pre-sales information to understand the structure of the x3650 M4 (E5-2600) offering, its key features and specifications, components and options, and configuration guidelines. professionals who want to learn more about the x3650 M4 (E5-2600) and consider its use in IT solutions. 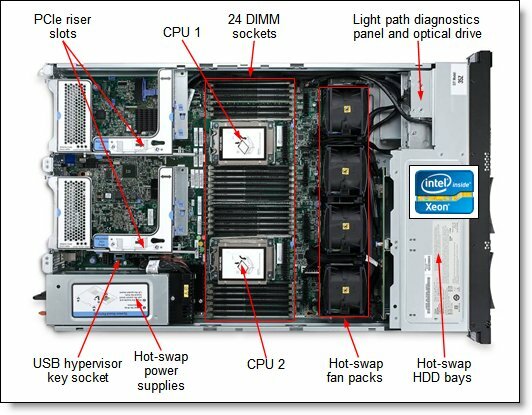 Note: This Product Guide describes withdrawn models of the x3650 M4 with the Intel Xeon processor E5-2600 product family. For currently available x3650 M4 models with the Intel Xeon processor E5-2600 v2 product family, see the Product Guide System x3650 M4 (E5-2600 v2). The System x3650 M4 server provides outstanding performance for your business-critical applications. Its energy-efficient design supports more cores, memory, and data capacity in a scalable 2U package that is easy to service and manage. With more computing power per watt and the latest Intel Xeon processors, you can reduce costs while maintaining speed and availability. Suggested use: database, virtualization, enterprise applications, collaboration/email, streaming media, web, HPC, Microsoft RemoteFX, and cloud applications. Figure 1 shows the System x3650 M4. The x3650 M4 offers a flexible, scalable design and simple upgrade path to 16 hard-disk drives (HDDs) or solid-state drives (SSDs) plus optical and tape drives at the same time, with up to six PCIe Gen 3 slots and up to 768 GB of memory. This flexible onboard Ethernet solution provides four standard embedded Gigabit Ethernet ports and two optional embedded 10 Gb Ethernet ports without occupying PCIe slots. Comprehensive systems management tools with the next-generation Integrated Management Module II (IMM2) make it easy to deploy, integrate, service, and manage. The x3650 M4 is an outstanding 2U two-socket business-critical server, offering improved performance and pay-as-you grow flexibility along with new features that improve server management capability. This powerful system is designed for your most important business applications and cloud deployments. Combining balanced performance and flexibility, the x3650 M4 is a great choice for small and medium businesses up to the large enterprise. It can provide outstanding uptime to keep business-critical applications and cloud deployments running safely. Ease of use and comprehensive systems management tools make it easy to deploy. Outstanding RAS and high-efficiency design improve your business environment and help save operational costs. Improves productivity by offering superior system performance with up to 8-core processors, up to 20 MB of L3 cache, and up to two 8 GT/s QPI interconnect links. Supports up to two processors, 16 cores, and 32 threads maximize the concurrent execution of multi-threaded applications. Supports up to 1600 MHz memory speeds. Supports up to 768 GB memory with 32 GB LRDIMMs or HCDIMMs. Intel Advanced Vector Extensions (AVX) significantly improve floating-point performance for compute-intensive technical and scientific applications. 12 Gbps SAS internal storage connectivity doubles the data transfer rate compared to 6 Gb SAS solutions to maximize performance of storage I/O-intensive applications. Up to 32 1.8-inch SSD bays, or up to 16 2.5-inch bays, or up to 6 3.5-inch bays, together with internal backup and an optical drive at the same time, provide a flexible and scalable all-in-one platform to meet your increasing demands. The server has four integrated Gigabit Ethernet ports and two optional 10 Gb Ethernet ports with mezzanine cards that do not consume PICe slots. The server offers memory mirroring and memory rank sparing for redundancy in the event of a non-correctable memory failure. The server has up to two redundant hot-swap power supplies and four hot-swap dual-motor redundant fans (two fan zones with an N+1 fan design) to provide availability for business-critical applications. The light path diagnostics panel and individual light path LEDs quickly lead the technician to failed (or failing) components, which simplifies servicing, speeds up problem resolution, and helps improve system availability. The x3650 M4 is Energy Star 2.0 compliant. Energy Star is the trusted, US government-backed symbol for energy efficiency, with the goal of helping customers save money and protect the environment through energy efficient products and practices. Highly efficient 550 W, 750 W, and 900 W AC power supplies with 80 PLUS Platinum certification. Available 750W DC power option. Low-voltage 1.35 V DDR3 memory RDIMMs consume up to 19% less energy compared to 1.5 V DDR3 RDIMMs. The server uses hexagonal ventilation holes, which is a part of Calibrated Vectored Cooling technology. Hexagonal holes can be grouped more densely than round holes, providing more efficient airflow through the system. Processor Up to two Intel Xeon processor E5-2600 product family CPUs with eight cores (up to 2.9 GHz) or six cores (up to 2.9 GHz) or four cores (up to 3.3 GHz). Two QPI links up to 8.0 GT/s each. Up to 1600 MHz memory speed. Up to 20 MB L3 cache. RDIMMs, UDIMMs, HyperCloud DIMMs, and LRDIMMs (Load Reduced DIMMs) are supported, but memory types cannot be intermixed. Memory speed up to 1600 MHz. Operating systems Microsoft Windows Server 2012 R2, 2012, 2008 R2 and 2008; Red Hat Enterprise Linux (RHEL) 5, 6, and 7; SUSE Linux Enterprise Server (SLES) 10, 11, and 12; VMware ESX 4.1 and ESXi 4.1, VMware vSphere (ESXi) 5.0, 5.1, and 5.5. * Model GSx includes preinstalled SAP Discovery System V5 - see below. Also includes Blank USB Memory Key for VMWare ESXi Downloads, part number 41Y8298. Model GSx comes preinstalled with SAP Discovery system V5. The SAP Discovery system is a fully configured and preintegrated service-oriented architecture (SOA) platform enabler for SAP development environments. The System x solution with SAP Discovery system provides a robust System x hardware platform for evaluating SAP software. The x3650 M4 model is pre-installed with a wide range of SAP software and development tools, the solution offers a fast, easy and cost-effective way to explore, evaluate and train on SAP products including SAP HANA, before deploying it in your infrastructure. Note: The model that includes the preinstalled copy of SAP software does not include a license to use such SAP software. Please contact your SAP representative to obtain the appropriate license rights to use the SAP software. 7915EAU 1x E5-2609 4C 2.4GHz 10MB 1066MHz 80W 1x 4 GB M5110e 512MB Flash 8x 2.5"
7915EBU 1x E5-2620 6C 2.0GHz 15MB 1333MHz 95W 1x 8 GB M5110e 512MB Flash 8x 2.5"
7915ECU 1x E5-2630 6C 2.3GHz 15MB 1333MHz 95W 1x 8 GB M5110e 512MB Flash 8x 2.5"
7915EDU 1x E5-2640 6C 2.5GHz 15MB 1333MHz 95W 2x 8 GB M5110e 512MB Flash 8x 2.5"
7915E1G 1x E5-2603 4C 1.8GHz 10MB 1066MHz 80W 1x 4 GB M5110e 8x 2.5"
7915E2G 1x E5-2620 6C 2.0GHz 15MB 1333MHz 95W 1x 8 GB M5110e 8x 2.5"
7915E3G 1x E5-2620 6C 2.0GHz 15MB 1333MHz 95W 1x 8 GB M5110e 8x 2.5"
7915E4G 1x E5-2630 6C 2.3GHz 15MB 1333MHz 95W 1x 8 GB M5110e 512MB Flash 8x 2.5"
7915E5G 2x E5-2650 8C 2.0GHz 20MB 1600MHz 95W 2x 8 GB M5110e 512MB Flash 8x 2.5"
7915K1G 1x E5-2609 4C 2.4GHz 10MB 1066MHz 80W 1x 4 GB M5110e 6x 3.5"
7915K4G 1x E5-2630 6C 2.3GHz 15MB 1333MHz 95W 1x 8 GB M5110e 512MB Flash 8x 2.5"
7915K5G 1x E5-2650 8C 2.0GHz 20MB 1600MHz 95W 2x 8 GB M5110e 512MB Flash 8x 2.5"
7915K2G 1x E5-2603 4C 1.8GHz 10MB 1066MHz 80W 1x 4 GB M5110e 512MB Battery 8x 2.5"
The x3650 M4 supports the processor options listed in the following table. The server supports up to two processors. This table shows which server models have each processor standard. If there is no corresponding where-used model for a particular processor, this processor is only available through CTO. Second processor options include an additional cooling fan. System x DDR3 memory is compatibility tested and tuned for optimal System x performance and throughput. System x memory specifications are integrated into the light path diagnostics for immediate system performance feedback and optimum system uptime. From a service and support standpoint, System x memory automatically assumes the System x system warranty, and Lenovo provides service and support worldwide. The System x3650 M4 supports DDR3 memory. The server supports up to 12 DIMMs when one processor is installed and up to 24 DIMMs when two processors are installed. Each processor has four memory channels, and there are three DIMMs per channel. Server supports UDIMMs, RDIMMs, HyperCloud DIMMs (also known as HCDIMMs), and LRDIMMs. Mixing different types of memory (UDIMMs, RDIMMs, HyperCloud DIMMs, and LRDIMMs) is not supported. 16 GB HyperCloud DIMMs and 32 GB HyperCloud DIMMs cannot be mixed. Mixing 1.5 V and 1.35 V DIMMs is supported; in such a case, all DIMMs operate at 1.5 V.
Maximum number of ranks per one channel is eight (with the exception of Load Reduced DIMMs and HyperCloud DIMMs where more than eight ranks are supported, because one quad-rank LRDIMM or HCDIMM provides the reduced electrical load on a memory bus). The maximum quantity of DIMMs that can be installed in the server depends on the number of CPUs, DIMM type, rank, and operating voltage, as shown in the "Max. qty supported" row in Table 5. Memory speed that is supported by the specific CPU. Lowest of maximum operating speeds for selected memory configuration that depends on rated speed, operating voltage, and quantity of DIMMs per channel, as shown under "Maximum operating speed" section in the table. If memory mirroring is used, DIMMs must be installed in pairs (minimum of one pair per each CPU), and both DIMMs in a pair must be identical in type and size. The following table shows the characteristics of the supported DIMMs. Tables cells highlighted with a gray background indicate when the combination of DIMM voltage and the number of DIMMs per channel still allows the DIMMs to operate at a rated speed. * Maximum quantity supported is shown for two processors installed. * Maximum quantity supported is shown for two processors installed. When one processor is installed, the maximum quantity supported is a half of the quantity that is shown. The following table lists the memory options that are available for x3650 M4 server. The following figure shows the first three of these configurations. All standard models, except models C4x and C5x, ship with eight 2.5-inch Slim-SFF SAS/SATA hot-swap hard drive bays. Models C4x and C5x ship with six 3.5-inch SAS/SATA hot-swap hard drive bays. The following table shows the internal storage expansion options that are available for x3650 M4 server. For models with eight 2.5-inch hot-swap bays, adds eight more bays for a total of 16 2.5-inch hot-swap HDD bays. This option includes a SAS expander card that is mounted on an HDD backplane, and it does not consume a PCIe slot. Does not include a SAS expander. Requires a second RAID adapter for the second set of eight drives. For models with eight 2.5-inch hot-swap bays, adds 16 1.8-inch SSD bays for a total of 24 bays. Requires two SSD controllers for the 16 SSDs. For CTO only. First set of 16 1.8-inch SSD bays. For CTO only. Second set of 16 1.8-inch SSD bays. Use with feature A39X to configure a total of 32 1.8-inch SSD bays. For CTO only. First set of eight 2.5-inch hot-swap bays for 12 Gb drive connectivity. Requires either one M5210 or one N2215. For models with 8x 12 Gb 2.5-inch hot-swap bays, adds 8 more 12 Gb bays for a total of 16x 2.5-inch hot-swap drive bays. For models with 8x or 16x 6 Gb 2.5-inch hot-swap bays, adds 12 Gb support for the existing drive bays (requires one 12 Gb drive controller). Includes two backplanes (one of these comes with a SAS expander card that is mounted on it). Includes two SAS HD internal cables. Includes power and signal internal cables. For models with 8x 6 Gb 2.5-inch hot-swap bays, adds 12 Gb support for the existing drive bays (requires one 12 Gb controller) or adds 8 more 12 Gb bays for a total of 16x 2.5-inch hot-swap drive bays (requires one 12 Gb drive controller; 8x 6 Gb drive bays are connected to the integrated M5110e, and 8x 12 Gb drive bays are connected to the 12 Gb drive controller). Includes SAS, power and signal internal cables. * These configurations are only available via CTO and special bid. Use the following table to determine what backplane kits you need. The following table lists the RAID controllers and additional options used for internal disk storage of x3650 M4 server. * The ServeRAID M5100 Series Battery Kit (81Y4508) is only supported with ServeRAID M5100 Series 512MB Cache/RAID 5 Upgrade (81Y4484). † This FoD upgarde requires one of the cache memory upgrades. * Requires cache memory upgrade (47C8656, 47C8660, or 47C8664). The following table lists currently available drive options for the internal disk storage of the x3650 M4 server. * Simple swap drives are for use in configurations that are only available via special bid or Configure To Order (CTO). The server supports the internal tape drive options listed in the following table. The x3650 M4 Tape Enablement Kit (69Y5320) is required to support these tapes internally. The server supports up to six PCIe slots with different riser cards installed into two riser sockets on the system planar (one riser socket supports installation of one riser card). Riser 1 supplies slots 1, 2, and 3. Riser 2 supplies slots 4, 5, and 6. Standard models have Riser card 1 installed with three PCIe 3.0 x8 slots. To enable slots 4 - 6, install a second processor and a second riser card. The following table lists the PCI riser card options available. * For CTO orders, the first feature code is for the first riser slot and the second feature code is for the second riser slot. The specific slots that are available depend on the riser cards installed in Riser socket 1 and Riser socket 2, as shown in the following table. Standard models have 69Y5321 installed in Riser socket 1. Tip: All slots support full-height adapters. Slots 1, 4, and 5 support full-length adapters, whereas slots 2, 3, and 6 (when present) support half-length adapters. Note: Slots 4, 5, and 6 require a second processor to be installed. The x3650 M4 Thermal Solution Kit, 46W8422 contains an 80 mm fan which provides the fourth system fan needed for the QLogic Dual Port 10GbE SFP+ Embedded VFA for IBM System x when only one processor is installed. The Thermal Solution Kit is not needed if two processors are installed, since the second processor includes this fan. The x3650 M4 supports four integrated Gigabit Ethernet ports. Optionally, two 10 Gb Ethernet ports can be added by installing one of the dual-port 10 Gb Ethernet mezzanine cards listed in the following table. These cards use a dedicated connector on the motherboard and do not consume a PCI expansion slot. The following table lists additional network adapters that are currently available for the x3650 M4. * SFP+ and QSFP+ based adapters require supported transceivers or DAC cables that must be purchased separately. ** The QLogic Dual Port 10GbE SFP+ Embedded VFA requires the x3650 M4 Thermal Solution Kit, 46W8422 or the second processor (with additional system fan). # Maximum quantity is achieved with two processors installed. With one processor, the maximum quantity is half of the listed value (this does not apply to mezzanine cards). The following table lists storage HBAs available for the x3650 M4 server. The maximum quantity listed is for configurations with two processors installed. If one processor is installed, the maximum quantity supported is half of the listed value. * The 5200GB and 6400GB io3 Flash Adapters cannot be factory installed; they are supported as field-installable options only. The server cannot be shipped with these adapters installed. The server supports GPUs provided the appropriate riser card is installed (one or two riser cards depending on the number of GPUs). For the NVIDIA Quadro K600, riser card 69Y5322 is used. For all other GPUs, riser card 90Y5085 is used. The server provides up to 225W of external power to each GPU. The following table lists the supported GPUs. Further restrictions apply depending on the power supplies installed as described in the Power supplies section. The server supports up to two redundant power supplies. Standard models come with one or two power supplies (model dependent). The following table lists the power supplies. 135W processors not supported; 130W processors supported with restrictions as listed below. Server on: 5 °C to 40 °C (41 °F to 104 °F); altitude: 0 to 950 m (3,117 ft); decrease the maximum system temperature by 1 °C for every 175-m increase in altitude. Supports cloud like workload with no performance degradation acceptable (Turbo-Off). The System x3650 M4 has a three-year warranty with 24x7 standard call center support and 9x5 Next Business Day onsite coverage. Also available are Lenovo Services warranty maintenance upgrades and post-warranty maintenance agreements, with a well-defined scope of services, including service hours, response time, term of service, and service agreement terms and conditions. Lenovo’s Hard Drive Retention service is a multi-drive hard drive retention offering that ensures your data is always under your control, regardless of the number of hard drives that are installed in your Lenovo server. In the unlikely event of a hard drive failure, you retain possession of your hard drive while Lenovo replaces the failed drive part. Your data stays safely on your premises, in your hands. The Hard Drive Retention service can be purchased in convenient bundles with our warranty upgrades and extensions. The x3650 M4 supports attachment to external storage expansion enclosures, such as the EXP2500 series, by using the ServeRAID M5120 SAS/SATA Controller. The x3650 M4 can also be attached to supported external storage systems, such as the Lenovo Storage S3200 (see the External disk storage systems section). † The ServeRAID M5100 Series RAID 6 Upgrade (81Y4546) requires 512 MB or 1 GB cache upgrades. ** Cannot be installed if an internal tape drive is installed. The controllers support connectivity to the external expansion enclosures listed in the following table. Up to nine expansion enclosures can be daisy-chained per one controller external port. For better performance, distribute expansion enclosures evenly across both controller ports. The external SAS cables listed in Table 27 support connectivity between external expansion enclosures and an external RAID controller (M5120 or M5225-2GB). Table 28 lists drives that are supported by EXP2512 external expansion enclosures. Table 29 lists hard disk drives that are supported by EXP2524 external expansion enclosures. The following table lists the external storage systems that are offered by Lenovo that can be used in x3650 M4 solutions. The following table lists the external backup options that are offered by Lenovo that can be used in x3650 M4 solutions. The following table lists the top-of-rack Ethernet switches that are offered by Lenovo that can be used in x3650 M4 solutions. 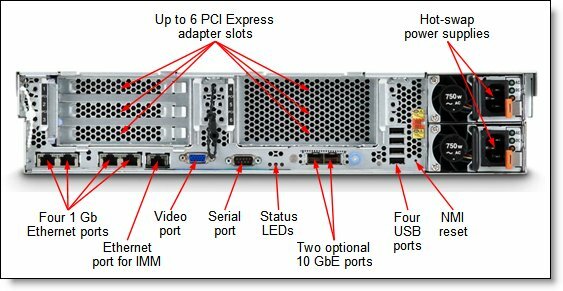 The following table lists the uninterruptible power supply (UPS) units that are offered by Lenovo that can be used in x3650 M4 solutions. The following table lists the power distribution units (PDUs) that are offered by Lenovo that can be used in x3650 M4 solutions. 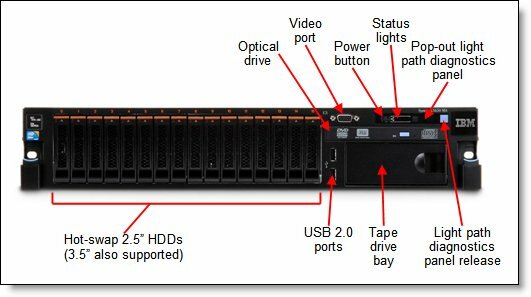 The following table lists the rack cabinets that are offered by Lenovo that can be used in x3650 M4 solutions. Microsoft®, RemoteFX®, Windows Server®, and Windows® are trademarks of Microsoft Corporation in the United States, other countries, or both.